If you had asked me 6 months ago if I liked Mojitos I would have been hard pressed to say yes. Heck even a week ago I was still on the fence, but this week has made me a believer. The drink is ubiquitous as I mentioned in my intro and I now realize why. 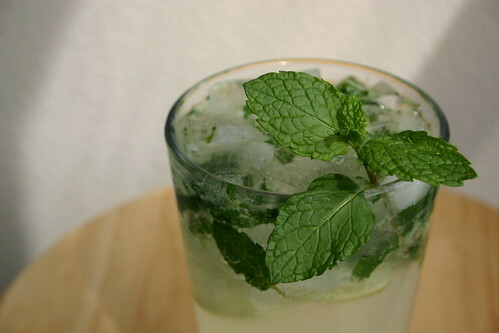 When mixed properly with good ingredients the Mojito is a fantastic drink. It’s refreshing like few other cocktails I’ve sampled. I really don’t have much to say about the recipe as I found Gary’s to be just right for me. I definitely suggest you try some variations (check out the comments for some interesting suggestions). They can certainly elevate this drink to even higher levels of greatness. As for lime juice versus lime wedges I say go lime wedges all the way unless you’re mixing up a bunch for a party. The visceral sensation of muddling the lime, sugar and mint really adds to the whole experience. Also, people far smarter than me have said that the muddling extracts oils from the lime peel that you wouldn’t get by using juice. Same goes for sugar versus simple syrup. Go sugar, it adds to the experience and acts as an abrasive to extract flavors from the mint and lime. So, I guess if I can only leave you with one thing about this cocktail it would be this. If you’ve had Mojitos and since convinced yourself you don’t like them, give it another go with good fresh ingredients. I bet you’ll be surprised by what you find.